GCalctool 5.30 was a case of two steps forward, one step backwards as I didn't have the time to complete all the changes I had planned. GCalctool 5.31 has these changes. Note that this is an unstable release at the start of a development cycle; the design will be refined before the 6.0 release (GNOME 3.0). The most noticable change is the use of colour thanks to a tip from Chris Lord. I've also added memory operations and squares and square roots. I'm not sure if this is too much (or too little) for "Basic" - feedback welcome. Programming and financial have similar changes but need more work. Number bases are easier to work with than in 5.30. It now starts fast. Really fast. It's a well behaved GTK+ application. This means that keyboard input and accessibility should work without any problems. The code is modular. 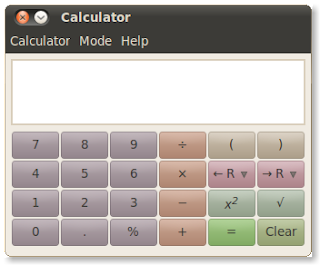 The calculator widget could be split out and used in other applications. Please try it out! If you are using Ubuntu Lucid you can try it using the GCalctool PPA. I'm not sure of a good label for the memory buttons, the current labels don't feel right. There's not a good way to delete variables/add new ones. I've been trying to integrate this into the popup menus (GTK+ is getting in my way). The colours are done using primary colours and blending them with the GTK+ theme. I tried using Tango colours but they looked worse to me. While removing the spacing between the buttons has reduced the optical illusion of the grid it still remains to some degree. I'm not sure if I can get around this without making custom widget (I'd like there to be no space between groups of buttons). Note the buttons do not have to be in a grid so please do a mockup if you have a good idea. The programming bit editor is too big. I have no idea what the "R" stands for in the basic mode. I don't use calculators much any more but I think in the "basic" mode it needs to be more easily understood. Have you ever thought of putting in a graphing portion? i would find that very useful! Maybe a very simple, basic and clear implementation of graphs would be nice (leaving the user to download other applications for more advanced options). @Ellipisis: The "R" buttons are the memory buttons, as I said I don't have good labels for them yet. History and (basic) graphing are features I want to add but they will have to wait for the next cycle. The real-world calculators I've seen use "Min" for storing and "MR" for restoring. I never thought it was obvious, but it was always consistent. I see and love how quickly this starts up, and the colours also make me happy. I had a recent painful experience with Windows' latest Calculator tool (which people seem to like for some reason), making me really appreciate your work here. Thank you for the focus on being useful instead of feeling like a “real” calculator. I like how switching number bases in Programming mode doesn't change my number (as displayed), but adds the base subscript. Neat touch! Thanks for this. It's looking fantastic. I did the Greek translation for Gcalctool, and I translated register as memory. I though that register was too "tech-speak" for a tool that can also be used for general purposes. So, I do think that using M would be a good choice, since that is what standard calculators use (either Min and MR, or M plus arrows). For translators, maybe you could also add a note saying something like: "Translate to the standard abbreviation used by calculators in your country for memory input and recall". Where is "%" in advance mode? I'm trying to avoid using "M" as I think it's not a good label either. It is better than R however. I left % out of advanced as it didn't fit well. I wanted to see if anyone would notice. 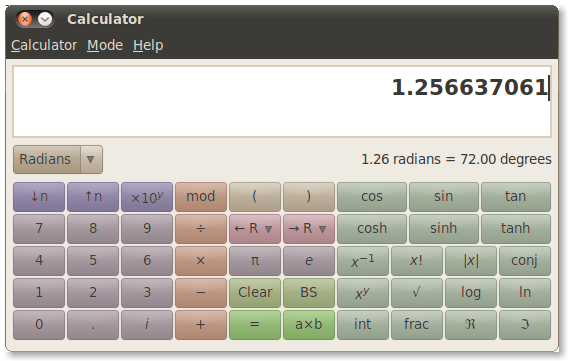 (Note that all these functions are available in all modes via the calculator). I think my old calculator uses "Sto" and "Rcl". Not much help. But, I also seem to remember "M+" and "MR" for store and recall, respectively. Just my $.02. that access one specific memory would be welcome. Is this going to be yet another program that I have to modify the colours for to fit my theme or will it use colours already in the existing GTK theme? If not the latter then this is backwards. Great work! I like the coloring. Perhaps you could integrate settings to change the colors (like in gnome-terminal). Anyway, a simple function plotter would be awesome! The memory buttons should access one memory cell, to eliminate the need to click twice (a drop down arrow can be placed to the right of each memory button for multi memories if needed). You have no idea how much I appreciate the colored buttons! To me, it's a giant leap in usability. Thanks much. A couple trivial typos, in advanced mode, the tooltip for superscript mode reads "Supercript" (missing an 's') and the e key reads "Eulers number", should have an apostrophe, "Euler's". as far as I remember GCaltool could store and recall a list with bunch of numbers in Lucid, but not anymore. Due to this missing feature I use qalculate in the meantime. The currency converter ist great. Thanks. Why is factoring numbers so slow? is orders of magnitude faster. I'm currently running 5.32 on ubuntu 10.10. I really liked from the previous versions, the STO and RCL in registers. I used them a lot. They were intuitive. Now with this new version, ->R and R-> are simply not user-friendly. Also, I tried to define a variable (have to mix keyboard and mouse to do that, while with previous versions only mouse), and then to add 1, but the name of the variable and the operation get messed up in the box. I'm not liking this new version, sorry. Am using version 6.2.0 in Xubuntu 11.10. Is there a command which will open gcalctool, or some way to configure the appication such that, it opens in Advanced mode?